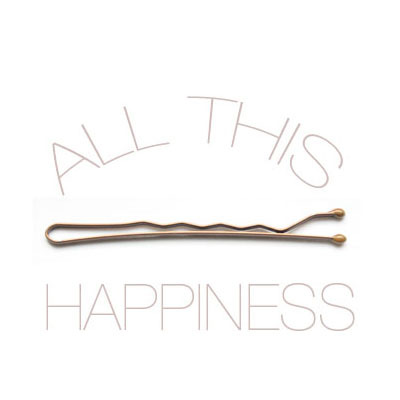 all this happiness: You Smell (In a Good Way). You Smell (In a Good Way). Perfume is a problem. It smells, and a lot of it gives me a headache (ages ago a rather nice sales-woman at a counter somewhere suggested I might have an allergy to 'white amber', whatever that is, and I don't know how true that could be). Despite this, I am fascinated by it. I love hemming and hawing over the little bottles. I'm fascinated by solid perfume, and the more cute, whimsical, or twee and charming the container the more smitten with something I am (although if it doesn't smell good there is no saving a delectable bottle). I tried Vera Wang's Princess for a while, but I think it's just a tad too sweet for me. My mother wears Chanel No. 22, which is not easy to find (especially since we do not have a Nordstrom here, which I heard carried it) although she has been making do with all kinds of versions of it ordered via ebay. I once had a strange green vial of perfume that was supposed to smell like tea (it did not, but it smelled good anyway) but once it was used up that was it. These days I'm yet another wear-er of Coco Mademoiselle. I'm not sick of it, it doesn't give me a headache, and sometimes when people smell me I get compliments. It's not too sweet, which I like, and it has the kind of iconic what-have-you lurking behind it that makes me feel like a grown up. Like when you finally figure out what your haircut is (I have yet to do this). This has become slightly tangential. The point is I have grabbed another perfume that I can't stop loving all day. I picked it up because I liked the product's packaging (I don't care. I do judge books by their cover, I like packaging and prints and lettering and all of that) and the little moisturizers, tiny bottles and pastels. Plus, testers! Testers are really gross because everyone touches them, and I am sure they fomites of the highest degree but I love smelling and smoothing. 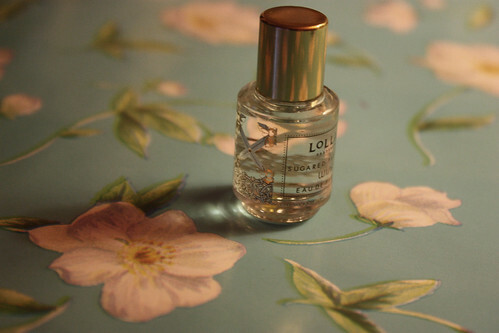 I bought the smallest bottle of Lollia's Wish because it had bees on it. Alright, the bees were not the only reason. I love things in miniature (especially tiny farm animals, but small dice or elephants or impossible small containers are also delightful), and it smelled just divine. Sweet, certainly, but not overly so and sort of spicy. I keep smelling it all day, at random moments on my hand or wrist, or in my hair (on my scarf) and being thrilled by it. I recommend it (I also don't mean for so many of my recent posts to be focusing on products, but you know. Sharing the four-one-one of favorite cosmetic items is nice, and helpful, and I like stuff). Apparently they are carried at Anthropologie, a store which my humble little city does not have (much to my dismay/disappointment/heartbreak), but they're being carried in a funny little boutique type place in a shopping center in my area. I will eventually have to go back to get the larger size, instead of the miniature one even if the tiny little bottle endears itself to me. i too love perfumes. i have a collection of my favorite tiny bottles on display in my room. coco chanel is currently the only perfume i'll wear. and yes, it does make you feel grown up when you wear it doesn't it? and it's a lovely non-offensive scent. i love the lollia scents. 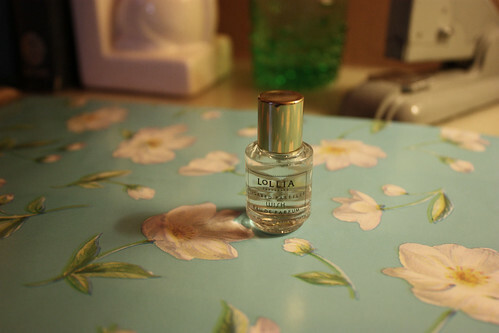 i do have an anthropologie in my area but i've yet to treat myself to a bottle of lollia. perhaps that will be my valentines gift to myself. I have such a hard time finding perfumes I love - mostly because I love the actual scent of things (tangerines, grapefruit, bergamot) not the mixes. But I did receive some Lollia hand creme for Christmas and I'm adoring it. there might be something here. Some unusual fragrances. I also love perfume bottles and packaging. It's just so frivolous and decadent that it's hard not to love it. I can't stick to one signature scent though. I have four that I rotate through. ah perfume! i was thinking of this subject this very morning for i had just bought the body lotion version of my perfume and i could smell it as i woke up. when you find your perfect scent its like an epiphany, a promise of a fresher more genuine you... for the first few weeks you can smell it everywhere, on your clothes, hair, like you said. though you do get used to the smell, its the scent that when people first meet you, remember you by and for your friends its unforgettable. my perfume of choice this past year, and hopefully for the foreseeable future is Paul Smith's 'Rose', like its name, its simple, not sweet, no sickly, overpowering floral scent. Just one, rose, almost like the real thing. i love perfume! it's a serious problem, lol! i started out with dkny's apple perfume, which was just about perfect for a young teenage girl. then, i received dolce and gabana's light blue for christmas and wore it very regularly (i have found it's the perfume guys like the best). next came chanel chance (my "grown up" perfume) and vera wang's princes (which is too sweet, but pretty nonetheless). for my birthday this year i requested stella by stella mccartney which smells like roses! i think it's my favorite so far! !!!! I discovered Lollia a few years back in a tiny shoppe downtown and bought a tiny bottle just like yours,but obviously ran out because it smells amazing. The store stopped carrying it so thanks for letting me know where I can find some.I'll have to hit up Anthropologie ASAP! I'm like you, a total sucker for adorable packaging. And all things mini. The simplicity of the charming bottle with its golden bees IS cute enough to tempt me also. Being a demure 42, I think over the years that my sensibilities regarding fragrance have changed. If complimented on a fragrance, I have a tendency to linger with it a bit longer; however, I have found that, at different biological stages in my life, scents do not hold the same merit. So far, scents by Chanel and L'Occitane have withstood the test of time with my body. And, ironically enough, have done the same with my maturing teenage daughter. I think, when a fragrance is made with quality ingredients, the fragrance has the tendency to maintain consistency. Both my daughter and I enjoy the natural elements of L'Occitane. Chanel perfumes are our luxury scents - she is a Chance gal; I prefer Coco for winter months and Coco Mademoiselle for the warmer months. Pretty packaging used to grab my attention, as well my daughter has been drawn to the pretty packaging as well. However, she is gaining some wisdom from me...wear what makes you smile, makes others smile, and provides you with the opportunity of being viewed as a "classic", just like your fragrance! Unlike most people, I love sweet perfumes! That bottle of yours is so cute! I have a love/hate relationship with perfume (my all-time favorites are from the CB I Hate Perfume line) - but I am NUTS for that Lollia Wish business! It smells indescribably swell. first time I heard about your perfume, it looks like I could like it. I love cinnamon :) and that's such a cute little bottle. I'm alaways changing perfumes, right now I came back to a childhood souvenir : YSL's Opium but one of my favourite's is Stella by Stella McCartney. I love your posts about beauty, and little random stuff like that :) I enjoy hearing about different beauty products, so I for sure say keep doing posts like this! Count me in as a perfume fan, long-time reader, and first time poster. Love your comment on finding a perfume or a haircut and feeling adult - still haven't figured that one out for myself but am definitely having fun trying. As for perfume, I think you might adore the Crazylibellule and the Poppies scents. The whimsical packing is lovely and because they're solid perfumes, they hopefully won't bother you. Beautyhabit.com and Anthropologie both carry them and Sephora has a limited selection. I love Encens Mystic (incense and vanilla) and Vanille Macarons (almond and vanilla). I also love your mom's signature fragrance. FYI Chanel.com is now selling No. 22 as one of the "Les Exclusifs de Chanel" albeit in giant 200 ml bottles! Thanks again for the wonderful blog ! Im not a perfume gal either, maybe some fruity oil rubbed on my wrists but that's it. Plus my skin will get sensitive. I'm not a huge perfume wearer, but I have been loving the dior scents lately. I have been wearing american eagle's scent for a while, mostly because I received it as a present, but I need to find a new scent. Least favorite thing to shop for :-/. might just have to get coco mademoiselle- ive been wondering what scent to get next. I love Lollia products. They make this amazing hand creme that makes your hands feel like butter. What a adorable bottle. I have yet to find the perfect perfume, perfume shopping is far too overwhelming. and am quite proud of it. I'm so glad you're back to regular blogging - there's an award for you on my blog! That bottle is adorable and I love the way you photographed it. Perfume gives me migraines, alas. I really can't wear it (and I'm also sensitive to scented lotions and make-up). But I was absolutely fascinated with finding a signature scent when I was a teenager (before my headaches got too bad). I read and loved all those article in fashion magazine about finding the right perfume to express your personality! i still love ralph lauren's romance. i know it's everywhere and i'm sure more sophisticated perfume-wearers think of it is as common and nothing special, but to me it smells like everything i like about scents. i love your blog. three cheers for complicated women! that bottle is the cutest little thing, I have a problem with finding a perfume I like too, I really love Chance by Chanel at the moment though! Eeep! What a delectable little bottle! I recently acquired Miss Dior Cherie for Christmas, and for the first several days, I think I held it up to my nose more than what would be considered acceptable. I'm almost afraid to spray it, because I know I couldn't afford it, so it must last until next Christmas! It's a good thing I lack a life, because I've decided to use it only for special occasions =). By the way, I just love your blog and have been a silent follower for quite some time! i love love love that smell!!!! I wear it almost everyday... along with Pink Sugar and 'Fall in Love' By philosophy. I just want to say that I love your blog, check back often, and have very similar feelings towards all those scented oils and such. Bravo! In regards to fashion accessories, when you have a minute you might want to check out, WHITNEY COOPER COMPANY on FB; an Albany fashion accessory company. Founded in 2008, the company offers, "Upscale fashion at a downtown price." I am a perfume junkie too! love thisone! what a great little post ... I too have bought a bottle of perfume because i liked the bottle it was armand basi ... beautiful scent, but hard to get hold of!! I love perfume. I collect vintage perfume bottles. I really love atomizers. Please enter my blog giveaway. I love Anthropologie! Glad there's one in my city, though, I can't go to it all of the time because some prices there are just not justifiable! Perfumes are great, I've got quite the collection. I love their packaging, so lovely. I tend to hold on to old perfumes WAY after they have "turned!" I sometimes wander into stores to test out a new fragrance, but am soon running away from pushy "perfume squirters" and pushy salesladies!! But I really must persevere and get busy! You've inspired me to get down to anthropologie to test out that perfume! I know the feeling, its like finding a decent pair of jeans, rare and magical. Perfume is one of my favourite things ever, I love how theres one for almost every mood of a person for different people. The bottles are work of arts in themselves, this one is adorable. I love perfume! I always like getting a bottle every year for Christmas, so I can add on to my collection! I just had custom-made perfume oil made by a pyschic/clairvoyant perfumist. The experience of picking the smells and seeing it all come together was amazing. I finally have MY smell! perfume can be so hard. i have the headache issue as well. i recently have switched to water/essential oil body spray - light & fresh! great great posts! I just discovered your blog and I love it! I just looked through a lot of your posts and you have a great eye, and wonderful taste. I found your blog through my list of "people like your blog, you might like these" over bloglovin. I am now following you and I would be so honored if you followed me!